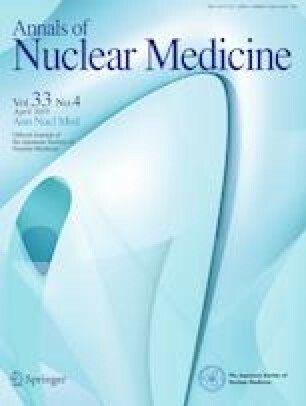 This study aimed to determine the level of 18F fluorodeoxyglucose (18F-FDG) activity in the normal adult appendix using positron emission tomography/computed tomography (PET/CT). We performed a retrospective review of PET/CT images using 18F-FDG in 563 consecutive asymptomatic adult patients without appendiceal pathology. We excluded 257 patients for an undetected or obscured appendix and three patients for appendicitis found on CT imaging. FDG uptake in the appendix was qualitatively and quantitatively assessed. The maximum standardized uptake value (SUVmax) was calculated for quantitative analysis with SUVmax of the normal liver for comparison. A total of 303 patients (200 males, 103 females, mean age of 66 years) were included in this study. Medical charts and histories were evaluated for patients who showed positive FDG accumulation. Pearson’s correlations between appendiceal SUVmax and age, body mass index, and blood glucose levels were analyzed. The mean appendiceal SUVmax was 1.14 (range 0.52–5.12) with an appendix-to-liver SUVmax ratio of 0.34 (range 0.06–1.28). Three patients qualitatively showed a positive FDG accumulation with appendiceal SUVmax greater than 3.00. There were no correlations between appendiceal SUVmax and age, body mass index, or blood glucose levels. FDG in the normal adult appendix shows a low activity level and is lower compared with normal liver. However, the normal appendix can rarely show high FDG accumulation. In such cases, differentiation from appendiceal pathology solely by PET/CT images would be difficult. The authors would like to express special thanks to Mr Naoto Kunitake, medical student in our university, and we also thank Ellen Knapp, PhD, and Gillian Campbell, PhD, from Edanz Group (http://www.edanzediting.com/ac), for editing the draft of the manuscript. The authors declare they have no conflict of interest. All procedures followed were in accordance with the ethical standards of the responsible committee on human experimentation and with the Helsinki Declaration of 1975 (revised in 2008). This retrospective study was approved by our institutional review boards.